100 Miles and Runnin' is N.W.A. 's third official album release in 1990 on Ruthless Records. Prior to the recording phase, all of the group members had just signed a long-term contract with the Ruthless Records label. However Ice Cube refused to the terms and consequently went his own way shortly. Although the album was released as an E.P., it nevertheless hit the charts and sold over 250,000 copies, reaching gold status (a feat that is not surprising considering the fact that the group was gaining more popularity as frontrunners of the increasingly trendy genre of gangsta rap). 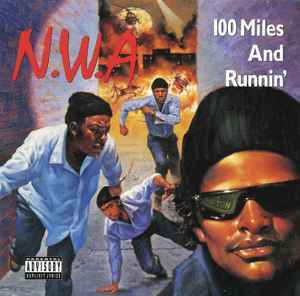 100 Miles and Runnin' was the first N.W.A. release after Ice Cube had left the group a year earlier. Roots of the N.W.A. vs. Ice Cube animosity originated here with subtle negative references to the ex-member such as, "We started with five but yo, one couldn't make it / Now there's four because the fifth couldn't take it". The title track "100 Miles and Runnin'" became the song that got the group major airtime on the radio and TV with an accompanied music video. Dr. Dre, who was working with The D.O.C. and Above the Law around the same time, shines in his production with the usual funk breakbeats and the slow synth groove on "Just Don't Bite It". A sadistic parody of the police on a skit featuring The D.O.C. from the group's 1-900 hotline introduces "Sa Prize, Pt. 2", a sequel to the controversial "F-ck the Police" originally off of the Straight Outta Compton album. Some of Eazy's greatest deliveries with the N.W.A. are found on this album. MC Ren and The D.O.C. provided the hard-hitting lyrics for Eazy-E and Dr. Dre. In the end, the album served to anticipate the group's upcoming album, Efil4zaggin. Later in 1990, on Ice Cube's solo debut AmeriKKKa's Most Wanted, replied attacks towards the N.W.A. were voiced by Cube and Da Lench Mob setting off an ongoing beef that remained up until 1994.